Hi. I just bought this old fretless jazz bass on a auction. Is there anyone there can id date this ? Look at the pictures and serial number. I could not find it via the serial number. The stickers on the neck is missing so is this a 60 or 80 or TJB 70 F or ? There is a replacement on the bridge that is not original. Should I clean it or will it then lose value ? The chrome-plated parts are eroded, dull, and can be cleaned up, but it may ruin the vintage look and will it go beyond the value? Does anyone know this and have an opinion on this? Thanks for all the input. Any idea what the value is for a bass like this ? It is a 1981 model spaghetti logo and sn starting with 10 means 1981. As for the model is it Nitro or Poly? Easy test take the pickguard off and dab a q-tip or something similar with acetone then touch the finish under the pickguard. Be VERY careful to not touch any finish on the bass with the acetone that will show until you find out if it is nitro. If the finish comes off nitro if not poly. The ST-80 and above (strat models) from 1981 or so were nitro 70 and below were poly. I cannot remember if the 80 or 100 or 120 and above on the jazz bass were nitro then the rest below were poly. Looks like Alder wood to me. Might be a JB80YSR or similar. It looks exactly like the 2nd one on that page. Probably is JB80FL or some other model than just JB80. Though I am not really sure what it would be. This is a 1982 catalog. The 1981 catalog catalog online does not have basses in it. Thank you. Ok so its is a 81 great. There is no pickquard on this model. But I can try the nitro trick under the control plate. I believe it is a JB 85 YSR FL. I found this in a catalog. I leave it as it is to keep the vintage look or polish and make shine. And would it loose value if you clean it ? I belleive this is a rare vintage Tokai. I would defiantly clean it. Personally I change out the MIJ pots for new CTS pots. I widen the holes with a reamer then put the cts pots in. That is what I do with wood guitars like Les Pauls and such. Yes, a Jbass has a metal plate for the pots in that can I would just buy a new plate cover and just put the new cts pots in that. I am not saying you should put new pots in if you do not want to. I am just saying that is the first thing I do with MIJ guitars. Change the pots to CTS, put PIO caps in a new pickups. I even put the Faber tonelock bridges on the Gibson type MIJ guitars and locking tuners on guitars. But that is just me. Does this ruin the vintage value of the guitar? Maybe but I would not say Tokais have vintage value like a Fender or a Gibson where they need to be 100% original. I come from the idea that guitars should sound their best and be used. But that is just me. Thank you, I think about it. I appreciate your input. The plating is nickel - not chrome, so clean gently with Silvo to retain the vintage patina. Can you take a look at the neck stamp and body stamp also as this will help to narrow down which of the 3 fretless JB models it could be as well as a more accurate date. they should resemble 3=12 YS A or a similar pattern. Definately 1981, number seems close to Sept/October . PS: leave it all original - maybe change the capacitor to PIO 0.047 chicklet - but don't change anything else. Thank you. I will have a look at the neck an body later on and let you know. What would it do to change the capacitor, any change in tone ? I will leave it original, just change the strings, trying different one. I thing the pick up sound very good in my ears. Don´t you find it strange that the tuners is reverse, what was the idea ? Do you have any idea what would be a fair price for a bass like this, I might had paid to much on a auction. but I´m happy. Thank you for your answer, I do appreciate all information. The tuners are correct for the style of Bass that Tokai is replicating. The lower Model bass' have a 3-screw clockwise turn. Yours being a 4 screw counter turn means it is a high end Model. On 1981 models the capacitor should be a Green Mylar cube, which are pretty good actually. If it has a small orange circular disc (ceramic) have it removed immediately. In terms of value, I try to stay away from these questions. It is worth whatever someone else is willing to pay at the time - period. I have had some $1000 LS-80 absolutely demolish $5000 Gibsons, so never let price be a factor of worth. Most professional musos are aware of Tokai and usually pander over them when they first see a real one in the "flesh". I recently sold a 1981 PB-60 Black/Maple with gig bag for AU$1100.00 so the 80 shoud fetch a little more . . . but again I did get a lot of low-ballers. Love it, but tidy your garden, man! I have never liked tokai pickups. That is why I have changed the PU of my tokai guitars. The tone caps will only make a difference if you roll the tone off. If the pots are changed to a higher value you will have a slightly brighter tone no matter if you roll the tone off or not. I have 1meg tone pots in a dark sounding lens Paul I have. When I have the tone to 8 or so instead of full at 10. They sound more like 500k pots. I am not saying to put 1meg tone pots in i am just saying how it changes the tone of the guitar/bass. So here is the latest photo. The capacitor is a Green Mylar cube just as you write. The pot do not scratch at all. The value..I know it is difficult I was just currios. I`m not sure what do you think ? No stamps under the pickup or names. guys. I hope with these numbers it is possible to tell more about this Tokai. Thank you for reply. Nice to know that you can change the tone with others pots. Learning every day. Great ! SO the stamp 6=10 YS A W tells me the finish is Vintage 3T Sunburst and it was made in June of 1981 during the 10th production run. The 'A' stamp on both neck and body shows it is a JB-80 or higher Model. JB-60 and lower do not have the 'A" stamp in the Production code. Also all Tokai hardware was made by Gotoh, so the threaded saddle can still be purchased as a seperate item to complete the look. Thanks for the info, you truly have a great bass there, for sure. As we say in Denmark `Blind hen also finds grains. I will fix the saddle for sure. Do you think it Is nitro ? I think It could be this one, JB 85- YSR-FL. It looks exact like this. I´m glad and you do know a lot about Tokai. As the solid base with the most complete and versatile sound, super bassist ranging from fusion to hard rock praises the original JB. Tokai reproduced the JB series with the original material, which has the almighty and creative super jazz sound. The newly developed pickup, JB vintage is reviving olde and versatile sound brilliantly. Unrivaled playability created from Alder single plate body and slim and narrow neck is unique to Tokai JB series. Dot position, the newly developed counter-wound old type krusonpeg combined with the head form produces an olde feeling. Spiral bridges, old lacquered finishes and perfectly finished detail are big appeals. Two kinds of fretless neck, which make full use of the wood base play, are prepared as options, meeting the expectation of Jaco Pastorious Freak. Four models of JB series are released. Fretless model long awaited by Jaco Pastorious Freak. The deep bass sound and Jazz sound is the appeal of this model. This is a high-grade model with slim narrow neck, alder body, and lacquer finish. This model is made to order, production will take about 1 month. 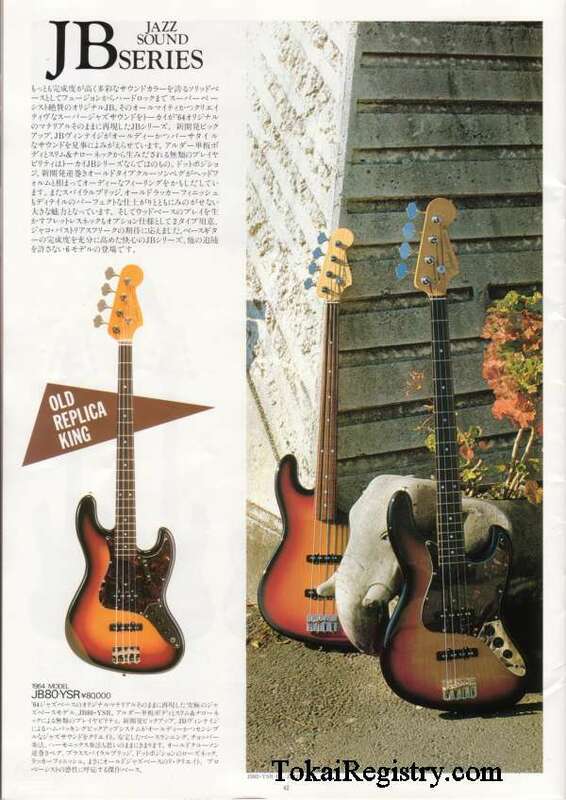 The highest-grade model of the JB series that is recommend to a professional bass player. Hakaranda finger board, Sen 1 piece body, Cashew finish are just professional grade. This model challenges the ultimate playability for a solid bass. It is a contemporary model with much sound variation. The tight and dynamic feel of the deep sound is sound very jazzy. High cost performance model recommend to for middle class age. The body, neck and hardware are inherited features from the high-end models. High quality jazz sound is for any music genre. The ultimate jazz base model that is reproduced with original material as the '64 jazz bass (JB80). Unrivaled playability with Alder veneer body and slim & narrow neck. The hambacking pickup system by JB Vintage creates olde and sensible jazz sound. Stable base running, chopper playing style, harmonics playing style can be played. It is a recreation of the old jazz bass, that is a masterpiece that responds to the sensibility of a professional bassist.